The 4th Annual Coach John McLendon Classic will be played in the first round of the 2019 CollegeInsider.com Postseason Tournament. The game pays tribute to Coach McLendon and the legacy of some of the great pioneers of the game, including Clarence “Big House” Gaines and Ben Jobe. The winner receives a trophy and advances on to the next round of the CIT. Last season Austin Peay won the 2018 Coach McLendon Classic and Grambling transfer Averyl Ugba was named the Most Valuable Player. It's the first time in NCAA Division I Basketball history that a “Classic” has been part of a postseason Tournament. The 2019 Coach McLendon Classic will be streamed through CBS Sports Digital. At the conclusion of the game there will be a trophy presentation for the winning team and a Most Valuable Player award will be presented to the game’s most outstanding player. Grand Canyon won the inaugural classic in 2016, defeating South Carolina State, 78-74. In 2017 Liberty beat Norfolk State, 73-64 and Austin Peay won the 2018 Coach McLendon Classic, 80-66 over UL Monroe. 1962 he became the first African American head coach in a major professional league (ABL) with the Cleveland Pipers. In 1966 he became the first African American head coach of predominantly-white university, when he took over the Cleveland State program. He led the team to their best record in school history. In 1969, McLendon was hired by the Denver Rockets and became the first African American head coach in the American Basketball Association. After a brief stint with the Rockets, McLendon ended his 25-year professional coaching career with a winning percentage of .760 and a lifetime career record of 523 victories and 165 losses. 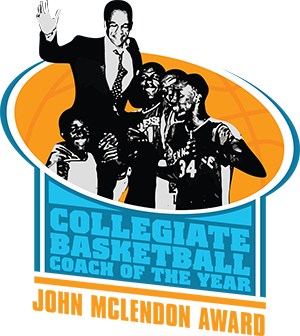 In 2012 CollegeInsider.com established the John McLendon award, which is presented annually to the top coach at all levels of college basketball. The award encompasses Division I, Division II, Division III, NAIA and JUCO. 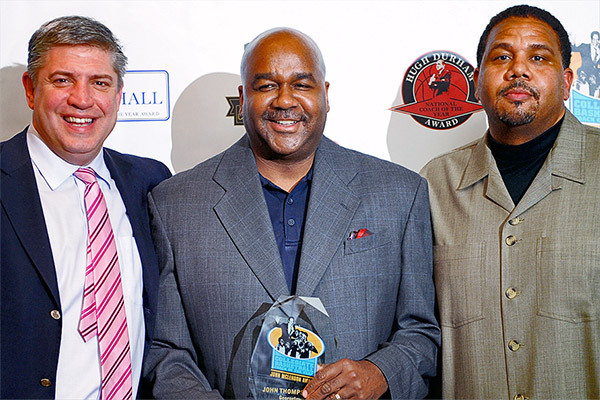 Georgetown head coach John Thompson III (center) was the recipient of the 2013 John McLendon award. Other past recipients include Horace Broadnax (Savannah State), Jim Engles (NJIT) and Gregg Marshall (Wichita State). UMES head coach Bobby Collins (right) was the recipient of the 2015 Ben Jobe award. Other past recipients of the award include Ed Cooley (Fairfield), Cuonzo Martin (Missouri State), Kevin Ollie (Connecticut), Willis Wilson (Texas A&M Corpus Christi) and Sean Woods (Mississippi Valley State). 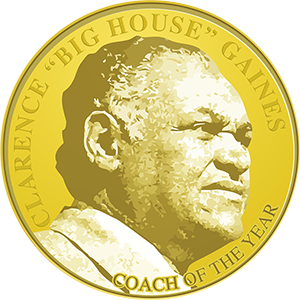 Established in 2011, the Clarence "Big House" Gaines award is presented annually to the top Division II coach in college basketball. One of the true legends of all-time, Clarence Gaines retired from Winston-Salem State University in 1993 with a record of 828-446. At the time he was the winningest active basketball coach in NCAA history. During his 47-year tenure at WSSU he coached some of the best to ever play the game. Among them are Cleo Hill, who was the first African-American from an HBCU to be drafted No. 1 by the National Basketball Association (St. Louis Hawks, 1961), and Earl "The Pearl" Monroe who averaged 41.5 points his senior year and led the Rams to the 1967 NCAA College Division II Championship. Monroe was elected to the Naismith Basketball Hall of Fame in 1990. 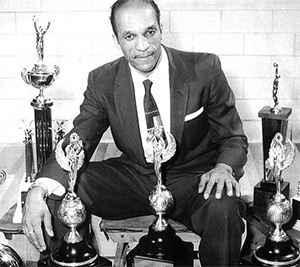 Eight years earlier Coach Gaines was enshrined in the Basketball Hall of Fame (1982). 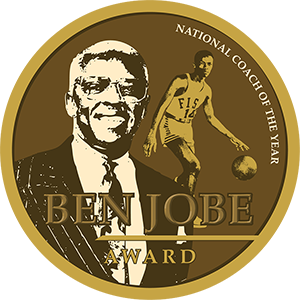 Established in 2010, the Ben Jobe Award is presented annually to the top minority coach in Division I college basketball. 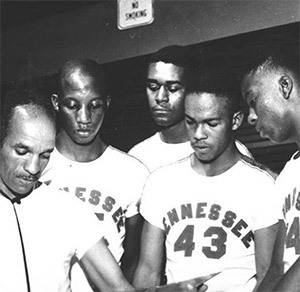 Coach Jobe is an icon in the history of basketball at Historically Black Colleges and Universities. He is best known as the head coach of the Southern University, where he spent 12 seasons. He was 208-142 and led the Jaguars to four NCAA Tournament appearances and one trip to the NIT. Perhaps his most memorable moment as a coach was Southern's 93-78 win over Georgia Tech in the first round of the 1993 NCAA Tournament. It stands as one of the great upsets in NCAA Tourney history. Jobe, who won 524 games in his career, was also the head coach at Alabama A&M, Alabama State, Talladega, Tuskegee and South Carolina State. He won five SIAC championships and 11 Southwestern Athletic Conference championships. Among the players he coached is former NBA player and coach Avery Johnson who is currently the head coach at the University of Alabama. CBS Sports Digital streams over 10,000 live events per year. Established in 1995 and acquired by CBS in 2005 - merged with CBS Interactive in 2008, and branded CBS Sports Digital in 2015. In 1944, coach John McLendon at the North Carolina College for Negroes (now North Carolina Central) felt he had one of the best teams in the nation. The Eagles routinely defeated their opponents by lopsided margins. Only, there was no way for McLendon to know how his team in Durham, North Carolina stacked up against the nation’s other heavyweights. The Eagles, like other black colleges, were banned from competing in the NCAA tournament and the NIT. Across town, the Duke University Blue Devils won the Southern Conference championship that year, but they were hardly the best team on campus. Rather, another all-white squad on campus, the Medical School intramural team, was plowing through its opposition. These former college basketball stars from across the nation were at Duke because the Army and Navy had started World War II training programs there. Despite Jim Crow laws that banned interaction, the YMCA chapters from Duke and North Carolina College had begun to meet on occasion in 1943, according to Scott Ellsworth’s book, the Secret Game (published in 2015). During one of these meetings, a Duke student was boasting about the Medical School team’s excellence. From this conversation, a game was born. McLendon, the legendary coach who revolutionized the game with an up-tempo style and fastbreak offense, wanted to see how his team would fare. He set up the game in the North Carolina College gym. (The basketball arena at North Carolina Central is now named in his honor). He arranged a referee and scorekeeper. A black reporter who found out agreed not to write about it, and McLendon scheduled the game for a Sunday morning, March 12th, when most of Durham - including the police force - would be attending church. There were no spectators. After a nervous start from both teams, the Eagles hit their stride. Their frenetic pace and fastbreak offense overwhelmed the squad from Duke, no different than other opponents. The Eagles won the game 88-44. Following a short break, players from the two teams mixed their squads and scrimmaged again. No other news reporters or local police learned about the game until years later. A scorecard doesn’t exist. Without question, the Secret Game was a landmark event, and within the next 25 years, college basketball was racially integrated in the south, due in part to the courage of those who arranged and participated in this game. “I am excited that CollegeInsider.com is paying tribute to Coach John Mclendon’s legacy and contributions to the game of basketball. Coach McLendon laid a great a foundation for me to follow and has an impacted my coaching career. “The John McLendon Classic is a wonderful idea to give Historically Black Colleges and University basketball programs an opportunity to showcase their talents. This game will give student-athletes a chance to compete in a game named after one of the great coaches of all-time. It's important that young people today know all that he achieved and accomplished. Coach Ben Jobe was a mentor for me. I know how important the game of basketball was to Coach McLendon and what Coach Jobe learned from him. I consider Coach McLendon as a role model, establishing a way for African American Coaches. I believe this classic will be a great success. I am glad that the people at CollegeInsider.com are recognizing Coach McLendon in naming this classic after him"
"We are very excited to announce the creation of the Coach John McLendon Classic, which recognizes one of the great coaches of all-time. This game, which will be a permanent part of the first round of the CIT, has been in the works for a few years and it’s finally become a reality. A lot of thanks goes to Ryan Tressler and the good people at CBS Sports Network who helped us to make the Coach John McLendon Classic a reality." - Joe Dwyer, President, College Insider, Inc.
"When you bring up the name Coach John McLendon you are speaking about someone who learned the game of basketball from its founder, Dr. James Naismith. 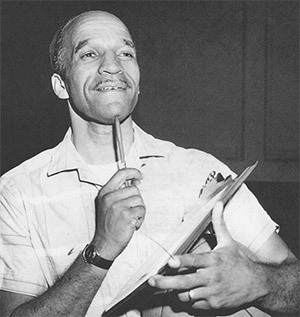 Coach McLendon was able to add a great deal to the game of basketball, including the up-tempo style of play, which was first credited to him. More importantly he was able to break down color barriers and continue to have a profound effect on those he reached. The John McLendon Classic will help to bring more attention to some of the pioneers of the game, like the great Coach McLendon." 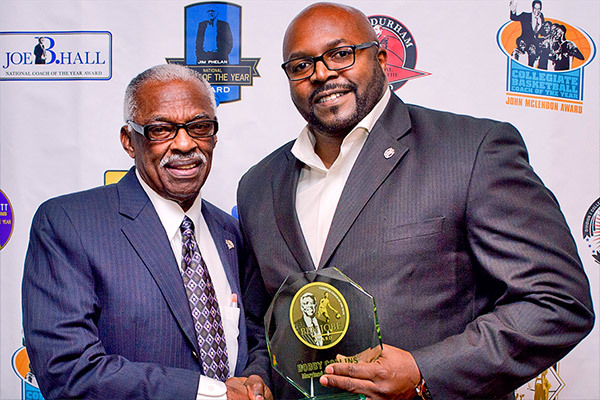 "As an HBCU graduate, I greatly appreciate the contributions of Coach John McLendon. He help set a precedent to the exciting brand of basketball that was played when schools were still segregated. His innovations were recognized by him becoming the first black head coach at a predominantly white institution. It’s an honor to be associated with this game. The John McLendon Classic is a great addition to postseason basketball." "John McLendon has been an inspiration to so many and I think this is a perfect tribute to his work in the game of basketball. Coach McLendon was a true trailblazer and this game is a great opportunity to showcase Historically Black College Basketball. This is a great idea and I have no doubt that it will be successful." "I did not have the pleasure of meeting Coach McLendon but I’m well aware of all that he accomplished and achieved in our great sport and beyond. This idea, this game speaks volumes about the people at Collegeinsider.com. The John McLendon Classic will not only help showcase our historically black colleges, but it will also give us a platform to remember one of the country’s greatest mentors." "This is an incredible idea by CollegeInsider.com. This new game included in the CIT will help showcase to the country quality HBCU basketball. This will provide tremendous exposure to the quality basketball coaches and players that are hidden gems in our HBCUs." "The Coach John McLendon Classic will help showcase both the past and the present. The game will feature some of the outstanding teams, coaches and players in the game today. It will also help to bring attention to some of the greatest teams, greatest players and greatest coaches in the history of college basketball. Coach McLendon is without question one of the best to ever coach. Hopefully this game will bring more attention to his incredible legacy." - Angela Lento, Vice President, College Insider, Inc.
"I continue to be amazed by Joe Dwyer, Angela Lento and the forward thinking of CollegeInsider.com. Their commitment to honoring those who have added value to the lives we enjoy as well as celebrating diversity is unprecedented. This Classic will be a great testament to these men who contributed so much to the game as we know it today. This is a phenomenal addition to NCAA basketball." "John McLendon, one of college basketball's greatest coaches and ambassadors, was inducted into the National Collegiate Basketball Hall of Fame as one of the game's 'Founding Fathers' along with Adolph Rupp, Henry Iba and Forrest 'Phog' Allen. Like Allen, he learned the game from Dr. James Naismith at the University of Kansas and went on to become a trailblazer for Historically Black Colleges and Universities. Coach McLendon's great legacy of leadership will be perpetuated by the creation of the John McLendon Classic." "It is awesome for College Insider to incorporate the John McLendon Classic into the opening round of the CIT and give the country another opportunity to see HBCU basketball at its best and to learn about a great coach that has done and given so much to the game of basketball." "CollegeInsider.com has really outdone itself this time. For some time now we have been discussing attaching a Classic to the CIT, and now it is finally a reality. I am also excited that a HBCU team will have a chance to participate in the Classic as we celebrate one of the greatest coaches ever in John McClendon. I have always been proud to be a part of this tournament, and I look forward to the great years ahead. Kudos to Joe Dwyer and Angela Lento!" "College Insider has shined a bright spotlight on HBCU schools with the implementation of the John McLendon Classic as a part of the opening round of the CIT. Coach McLendon was an all-time great coach of the game of basketball and a pioneer. Fans will now get a chance to reconnect the great history of our game with the excitement of today's postseason competition." © 2019 CollegeInsider.com. All rights reserved.